This high temperature, heat resistant and thermal insulating PTFE coated tape offers the advantage of a non-asbestos material with a higher temperature range and with excellent resistance to almost all solvents, caustics and acids. This high temperature PTFE coated tape is used as a gasket and seal material and also as an insulation material for wire, cable, hose, tube and pipe carrying high or low temperature liquids or gases. Available in a Premium Grade and Industrial Grade (Premium is a denser and heavier fiberglass weave than Industrial). The base fiberglass fabric is rated to 1000°F / 537°C while the PTFE melting point is 620°F / 327°C. Available in 1/16", 1/8" and 1/4" thickness and 0.5" to 6" widths. The high temperature and chemical resistant tape is available in Plain and Drop Warp Styles. 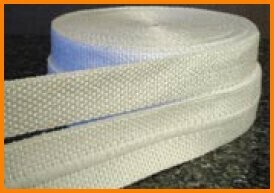 Drop Warp tape has several of the center lengthwise yarns missing during weaving, and allows the tape to be easily used for bolt-hole applications (sometimes called a ladder tape or bolt-hole style tape).